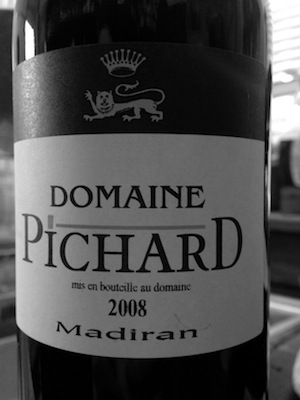 A heavy beast of a wine with all the layered textural complexity of high-end Bordeaux… for a fraction of the cost. I love wines made with Tannat and those from Madiran especially… they’re typically inky, weighty, earthy, beasts that serve as a separate food course entirely; they’re the Guinness of the wine world! If that sounds like a good thing to you then read on… otherwise I’d skip this, however good a wine it may be, it’s still so heavy it won’t be everyone cup of tea. In the glass this has a deep purple black colour with inky black fruits (Blackcurrant, blackberry), liquorish and sweet spice aroma. On the palate there’s a dark brooding minerality pulsing slowly through intense black fruits, high acidity, ripe but teeth coating tannin and long complex tobacco leaf and cedar finish. This is great wine in dire need of good food. Perhaps the most startling characteristic of this wine is its heavy pulsating texture, that lends an almost living quality to the wine… something usually only found in the most expensive of high-end Bordeaux wines, yet here to be found for £10.95 a bottle from The Wine Society.